So you think you're smart huh, SmartWatch 2? Unconvinced by the Samsung Galaxy Gear, but still want a wrist accoutrement to work in tandem with your smartphone? Well, Sony's SmartWatch 2 can now be strapped on in the U.K. and parts of Europe. The Android-based device, announced in June this year, is now on sale for £149 (about US$240, AU$258) with a rubber wristband or £169 (around US$272, AU$292) with a fancy metal strap. The release of the touchscreen device also sees the launch of a new accompanying smartphone app from the Google Play Store. 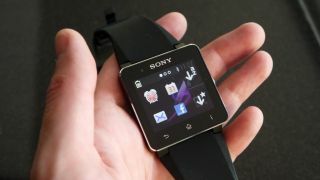 The SmartWatch 2 SW application, which is a free download, will enable the wearable accessory to play nice with other Android smartphones via Bluetooth. The launch of the SmartWatch 2, which is water resistant and brings NFC connectivity, gives users even more choice in an increasingly densely populated space in the tech world. Since the arrival of the original, and largely unsuccessful SmartWatch, the Pebble Smartwatch has hit the market following a phenomenally successful Kickstarter campaign. Earlier this month, Samsung really placed the four legged feline among the somewhat annoying flying rats by launching its Galaxy Gear. That device also went on sale this week. However, the one most likely to shape the future of the sector, the rumoured Apple iWatch, is yet to make its presence known, with time running out for a pre-2014 launch.